So far this year has proved to be a good one. 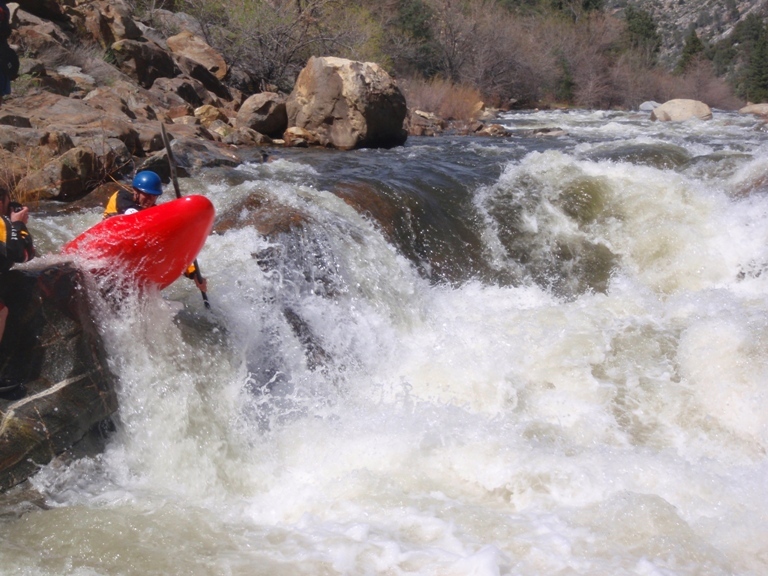 For the 5th or 6th write-up in a row I am going to start by saying, “this run has been on my list for a long time.” I believe the first time I saw pictures were on the dreamflows whitewater photos page followed a short time later by the photo on the cacreeks write-up. 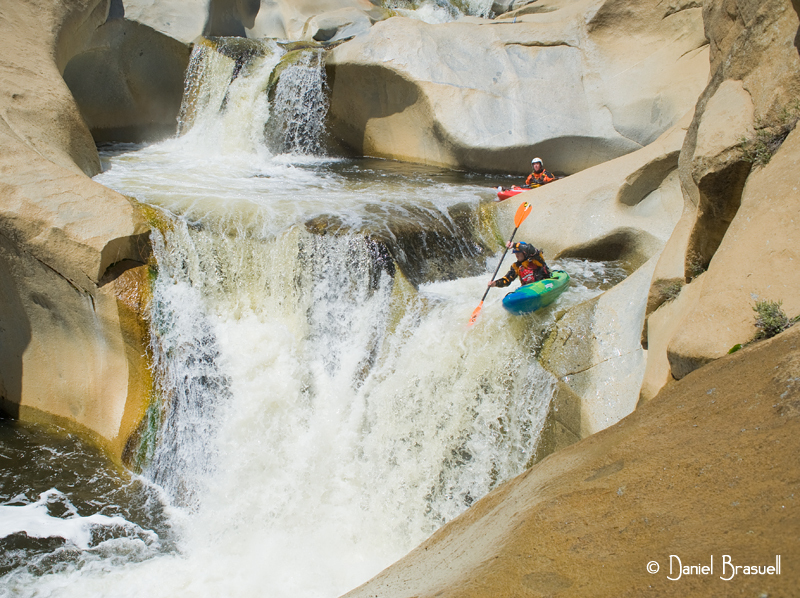 If that photo alone doesn’t make you want to make your way to this creek I don’t know what would. 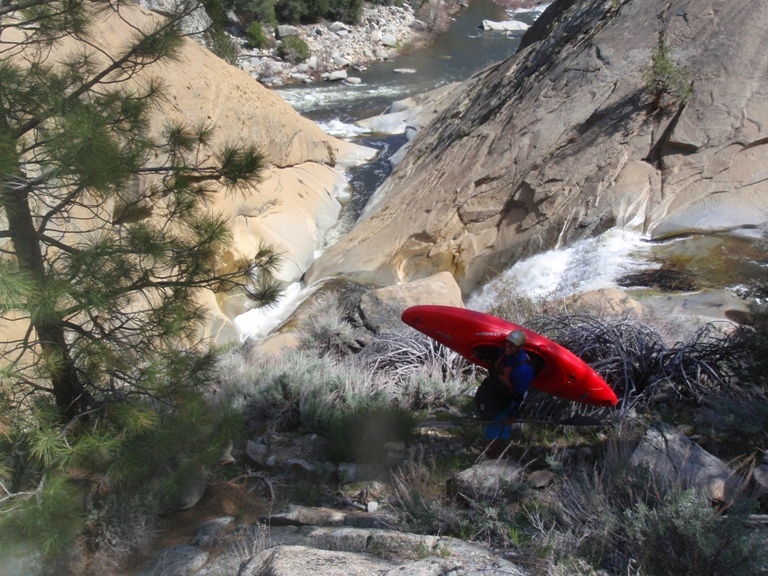 Taken from the side of the river that a kayaker can’t get to, the vantage point allows for a view of all six of the runnable drops. 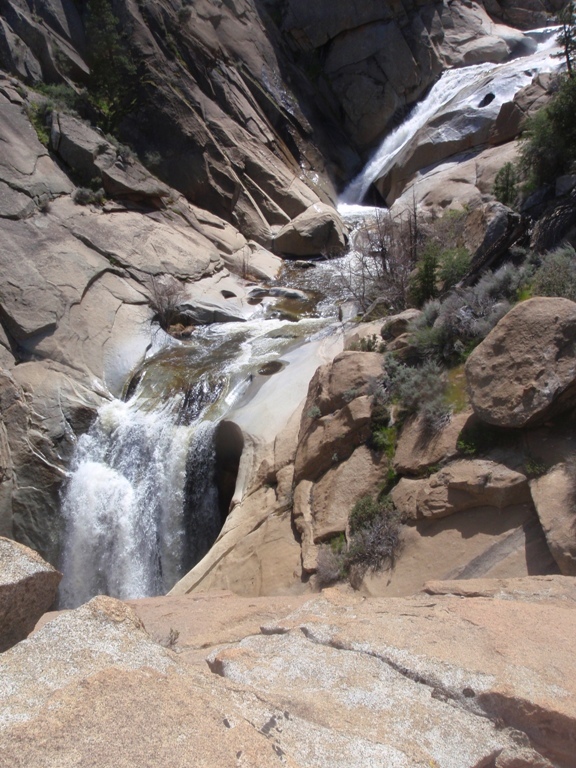 Showing the perfectly round tea cups at the base of each falls, falling one after another as the creek plummets many hundreds of feet down to the North Fork of the Kern below. As we began to ask around for beta we found out there are two ways to access the creek. One involved driving further up the highway from Johnsondale Bridge, granting quick access to the creek by involving 1.5 miles or so of portaging to make your way down the creek. 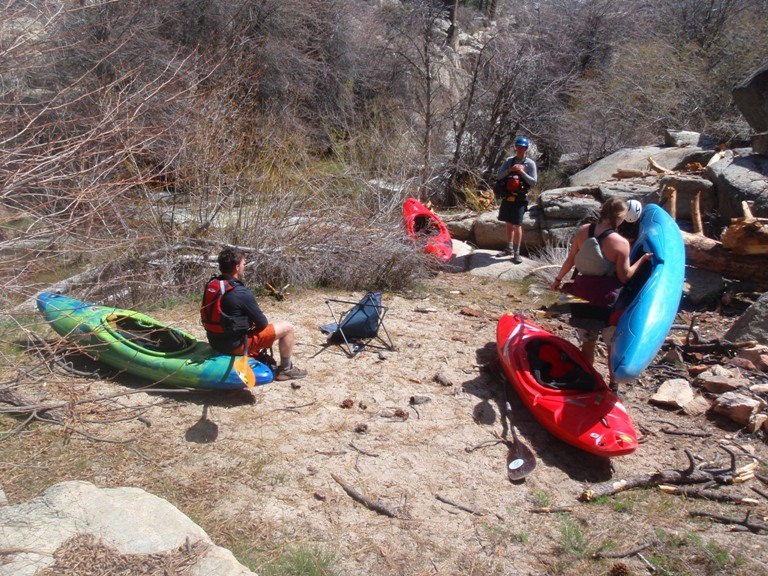 The other method was to drive just a short distance up from the bridge and hike 2 miles to the creek. 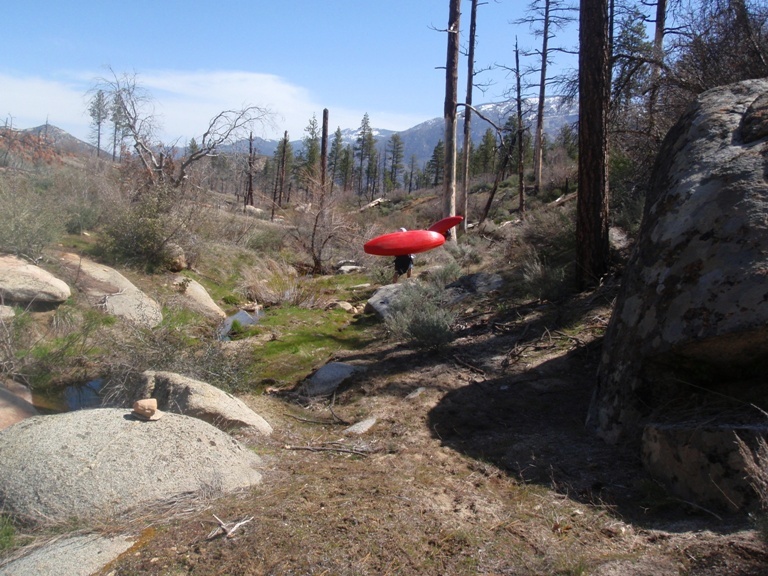 Once at the creek, you could run/portage another quarter mile or hike over one more easy ridge and drop straight into the Teacups. We choose for the direct hike straight to the teacups. The hike comes out to 2.25 miles and although the beta will sounds a little dubious, was quite accurate and easy to follow. The hardest part of the hike can be skipped if you have a solid 4-wheel drive truck that can climb the first 1/3rd of a mile. After that initial climb of several hundred feet the hike peters out and is nearly all a gentle downhill until the last small ridge to crest over in order to drop straight down into the tea cups. Once at the tea cups you will want to scout all of the drops which requires you to walk all the way down the slope to see each drop. Make sure to take the time to at a minimum look at Number 2 and Number 3 from below. You will also want to make sure you make a mental note of the eddy below Number 6 as venturing below that point could end with devastating results. As the water comes up, I would also recommend setting a rope in Number 5 as the pothole on the left side is known for swimming folks. 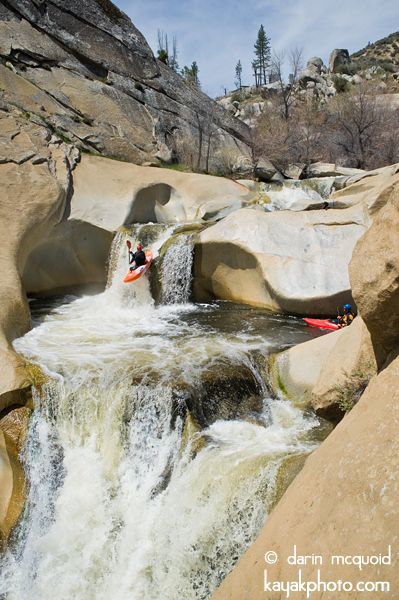 Once you have satisfied your free-fall desires for the day, it is time to continue portaging down to the Kern Confluence. 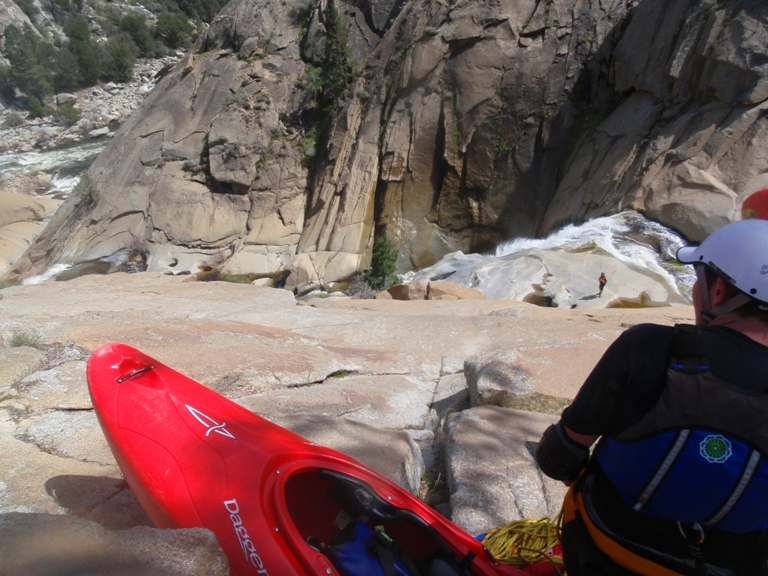 Depending on the size of the group and willingness to walk down steep granite with a boat and without a rope the portage can take anywhere from 20 minutes to an hour. 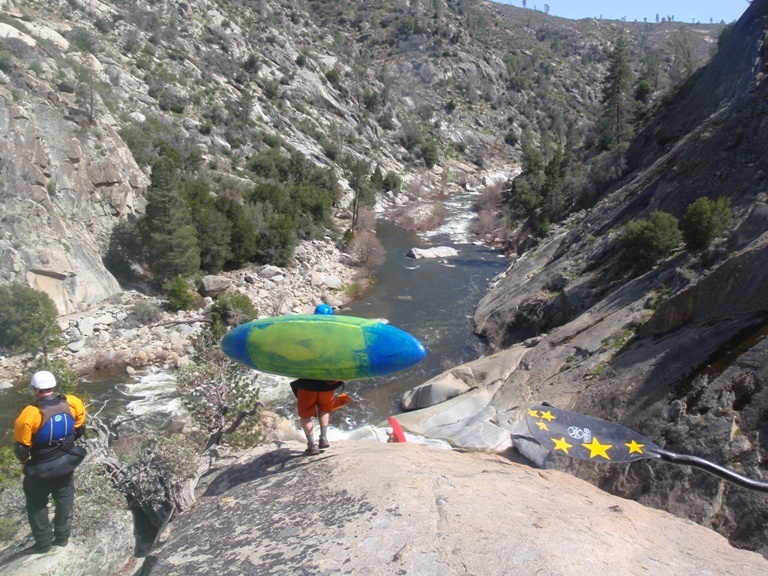 Once the portage is done you get an amazing no-stress slide to kicker/vert that lands you in the North Fork of the Kern. 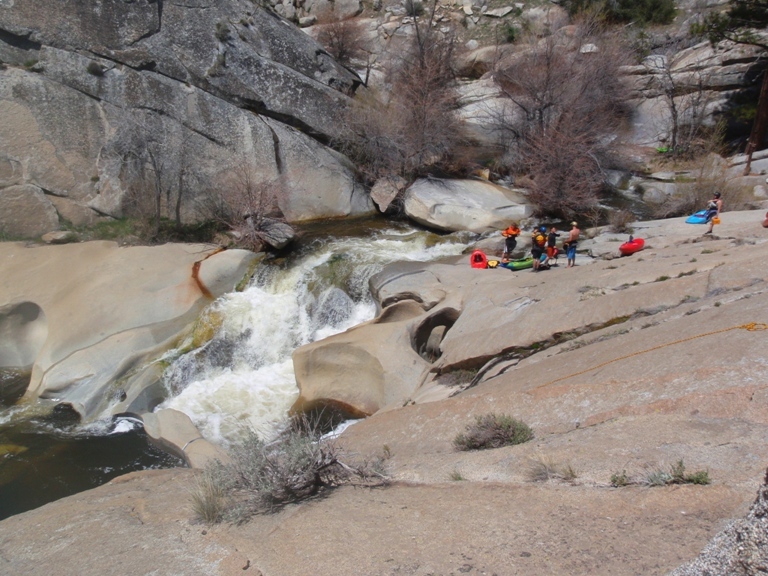 The 1.8 miles to the bridge go by quick and contain a few class III/IV rapids and at mile 1.25 you have the class V Carson Falls. 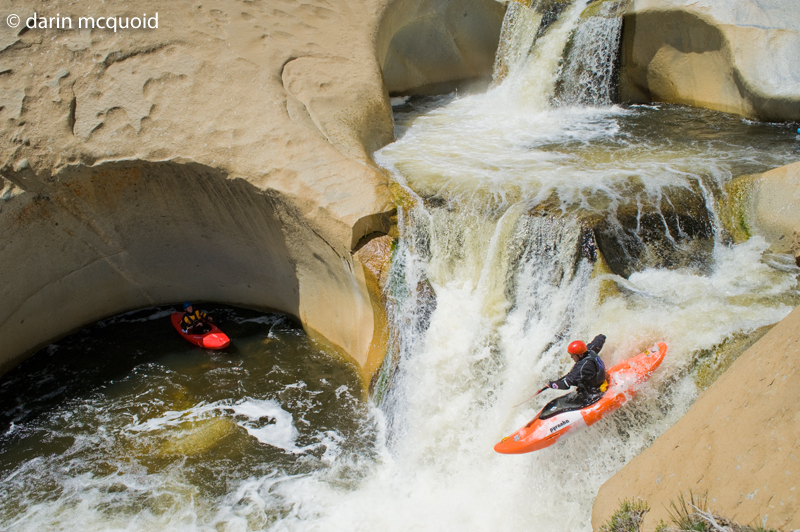 Make sure you eddy out and scout the rapid. 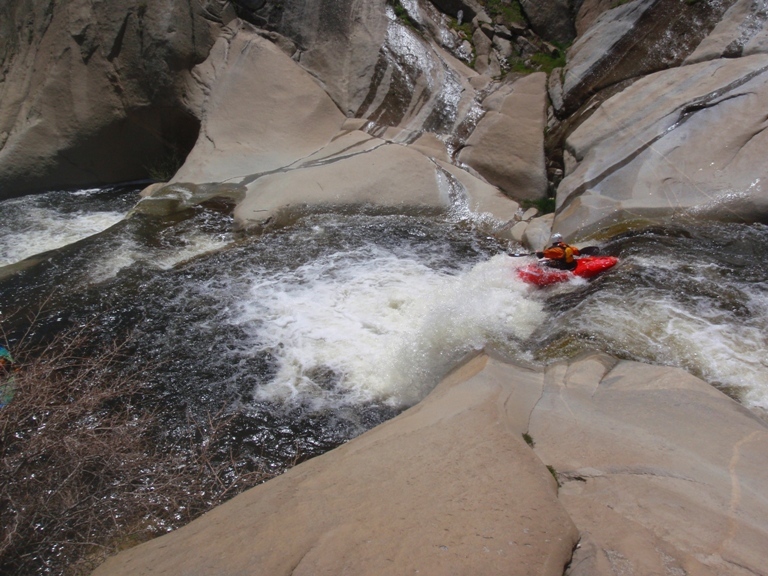 It is obviously larger and longer than any of the class III/IV rapids and eddies exist above the whole thing on the left or after the class IV lead-in just above the crux on the right. Be careful in the lead in as there are a few holes that can spice things up if you are not paying attention (or by this time, very tired). 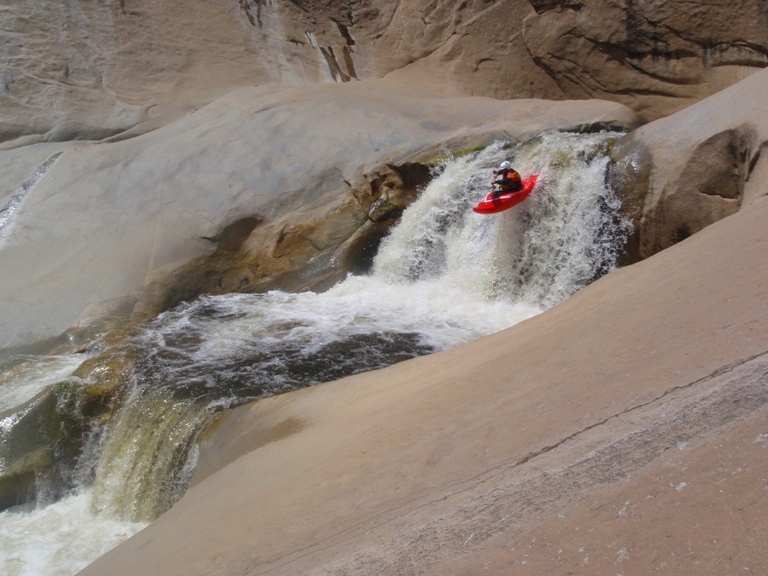 All in all, though this run is a lot of work for 6 waterfalls, the scenery and experience make the trip well worth it. I am not saying I am going to go back next weekend, but I know I will go back at some point. 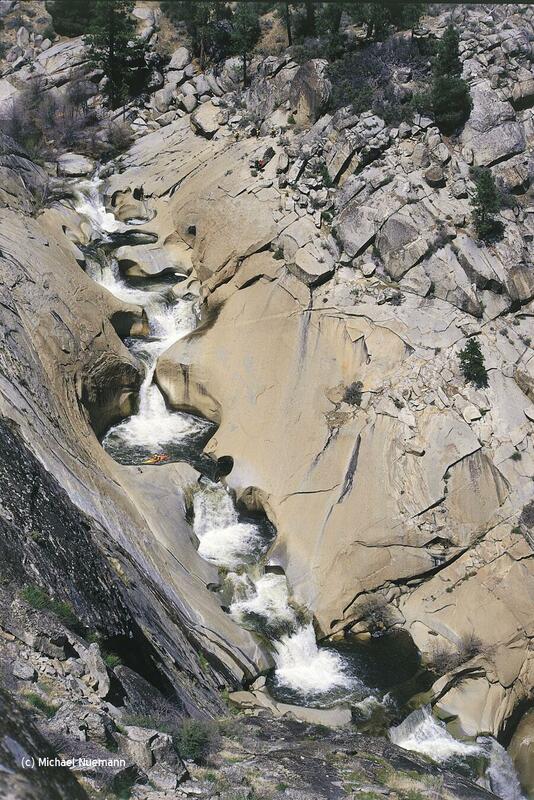 It isn’t everyday that you get to stand at the lip of so many waterfalls buried deep between two high granite walls. Some parting thoughts, I thought we had optimal flows. 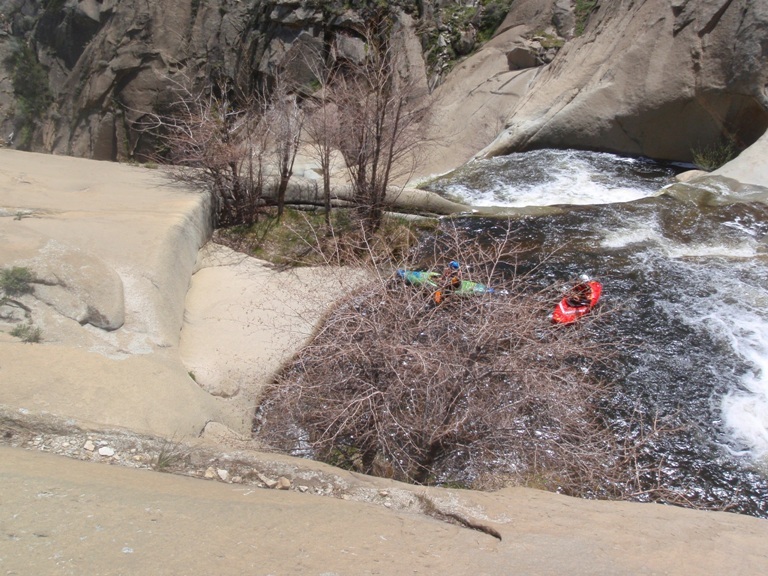 Mid April with the first of the snowmelt coming down bring the North Fork in Kernville up from 1,000 to 1,500 cfs over the previous few days. This flow make the drops clean and still allowed time to catch eddies. I wouldn’t have wanted to have been upside down in any of the drops other than the crack drop as that is the only one with a recovery pool. Although each drop is in and of itself only class IV to IV+ or so, I think that the drops linking together so quickly demand a class V mindset. I know I was scared and intimidated looking at the drops. All in all this creek is much more demanding than a normal flow on Brush Creek. Also, thanks to Michael Neumann for contacting me and sharing his photos with me. Number 0: Some people apparently run this, I think it would depend on the flow. 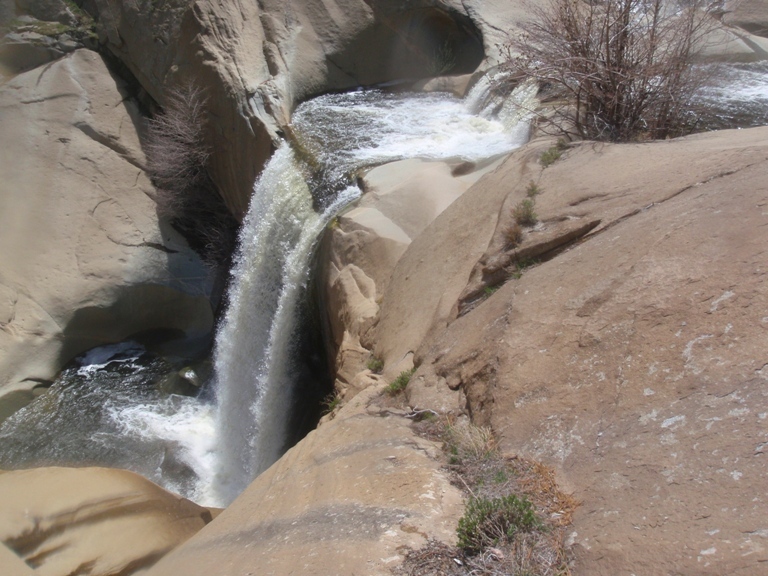 The water lands in a small eddy and then goes under a 3 foot deep land bridge. You would have to balance yourself and climb onto the land bridge to get out, not our idea of a good time. Instead we lowered our boats down to the land bridge and put-on on top of it. Number 1. From the put-in eddy we ferried to the right side and caught the small eddy in a pot-hole. 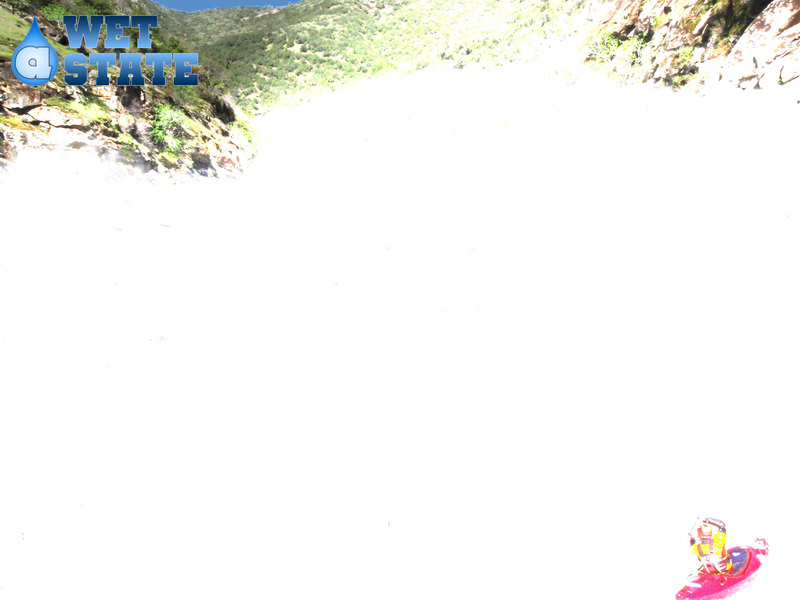 From there we were able to drive left and boof left into the eddy prior to the next drop. Number 2. Commonly folks run this drop on the right, however that looked a bit junky. We choose instead to drop left into a small pothole and immediately boof out against the wall. Don’t flip in this drop or you may run the next drop upside down! Number 3. 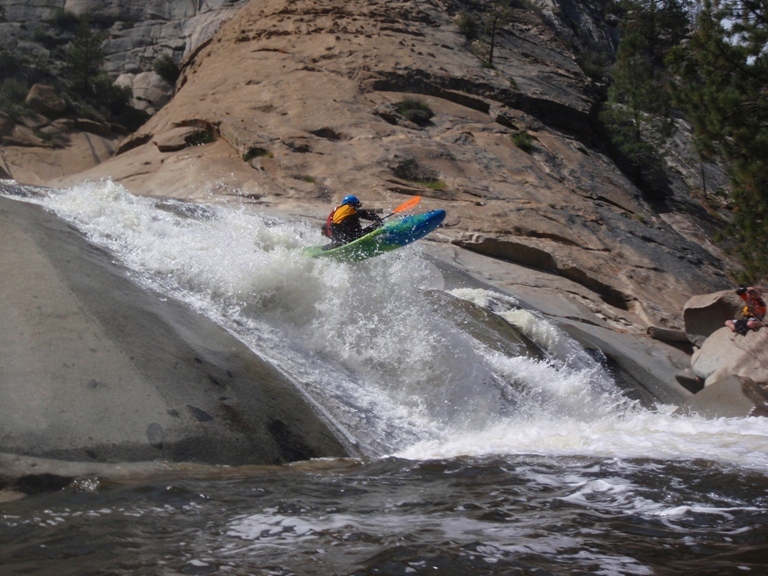 How often do you run a ~20 foot falls and land on your head? I guess it would depend on how often you run this drop. Only one person of the 6 of us managed to stay upright. 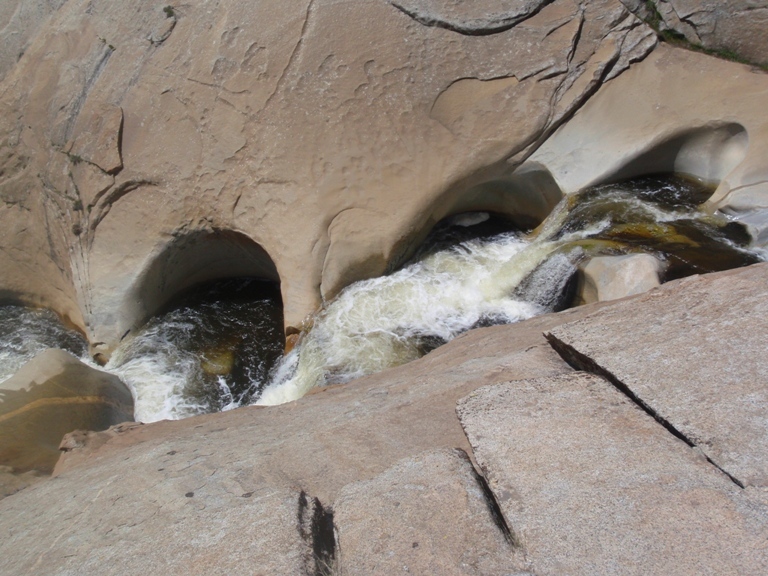 The crack is too narrow to go through not on edge, and then do to the pinch and associated currents you are thrown up-side-down until you reconnect at the base of the falls. Good fun, try to remember to tuck your head and your arms, don’t land in a high brace or you could easily pull your shoulder out! Number 4. Very straight forward. 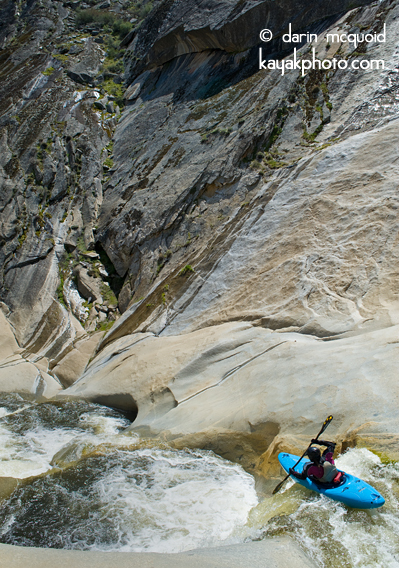 The only challenge to this drop is landing it with enough control to go where you want on the next drop. 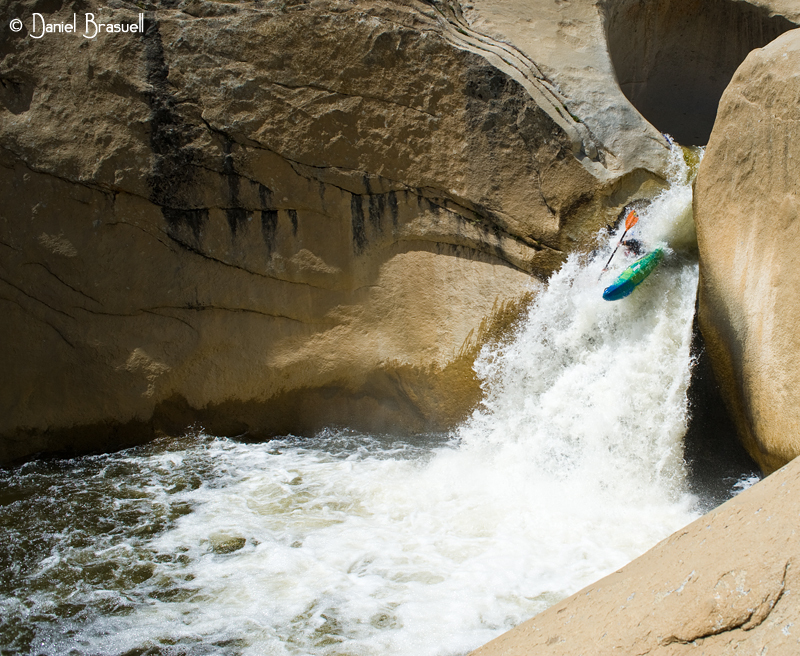 Either boof left to catch the small eddy or boof towards the pot-hole or slide of the next drop. Number 5. A sticky pothole on the left and a mindless small slide on the right. We were all afraid of the pothole as although it looked easy enough to boof over, it also looked easy enough to get trashed in. Most of us also were forced to link our runs of Number 4 and 5 together. Number 6. A nice ledge that is runnable virtually anywhere. 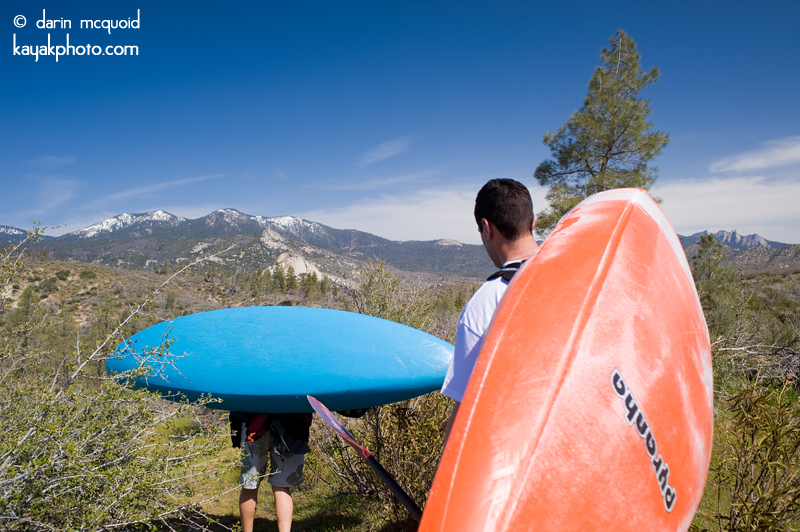 The outflow flows into the portage so make sure you get to the left shore before entering the next falls. 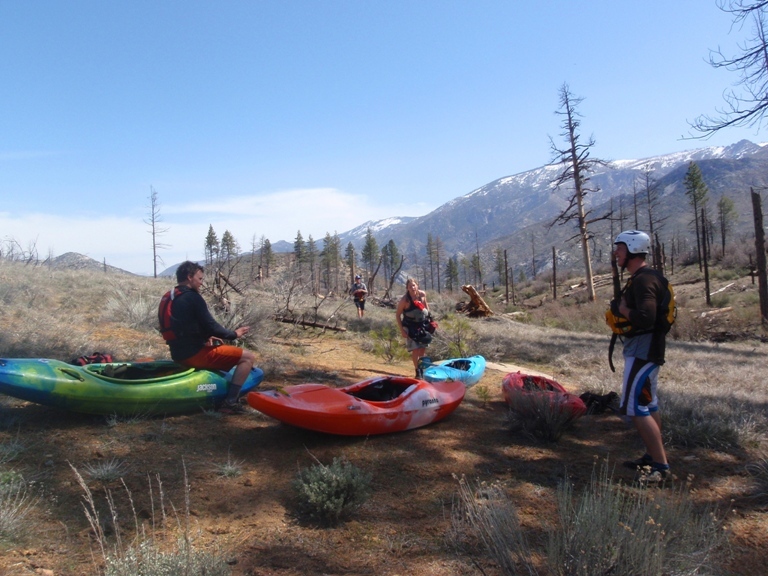 Portage Route. 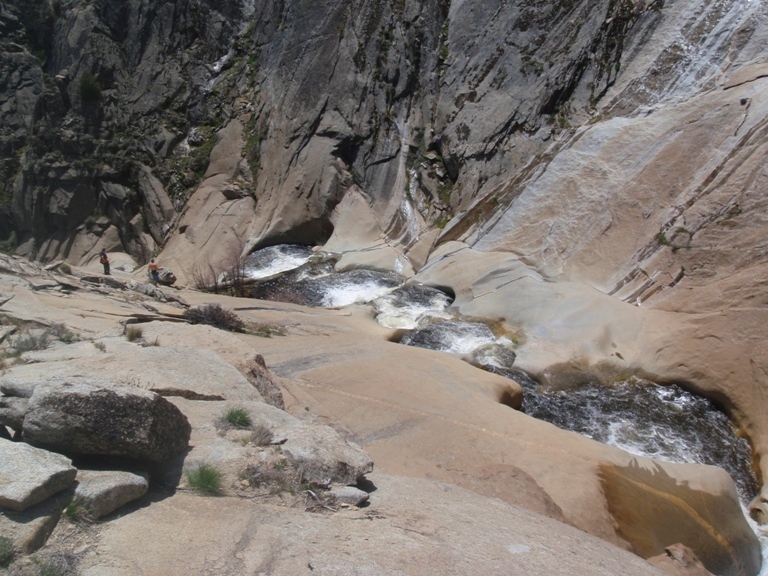 From the base of Number 6, we walked up to a bowl in the granite that slopped down to the base of Number 7. 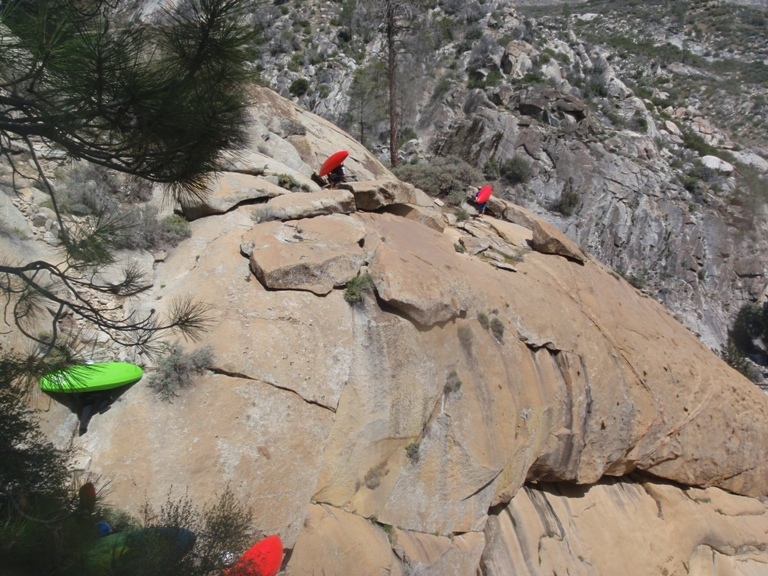 We lowered the boats with ropes and then carefully walked down the very steep (but thankfully tacky) granite. 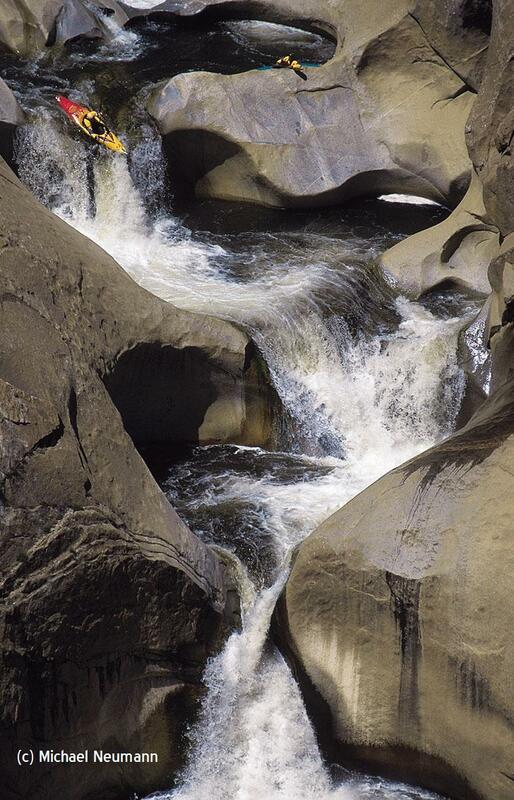 The last 10 feet can be but slid into the slab below or there is a bolt in the rock that can be used for a rappel. From there, we stayed higher in the scree slope walking far around Number 8 and the top of Number 9. 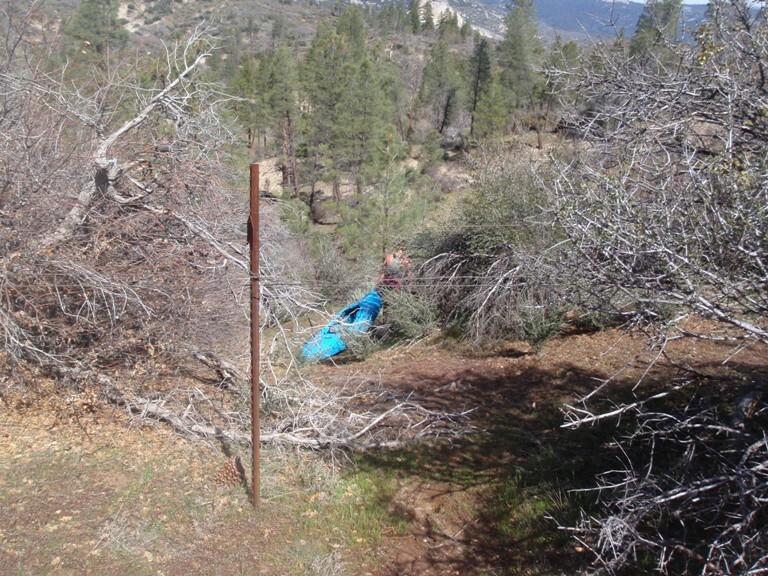 From there we descended to a small trail that hits the wall forming Number 9. 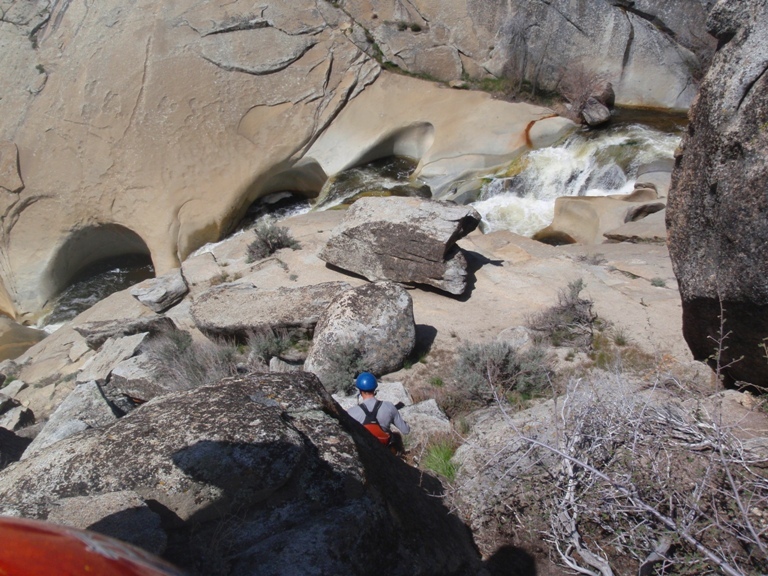 This part was sketchy as we friction climbed 20 feet of steep granite that slipping would result in swimming Number 9 including the sieve. 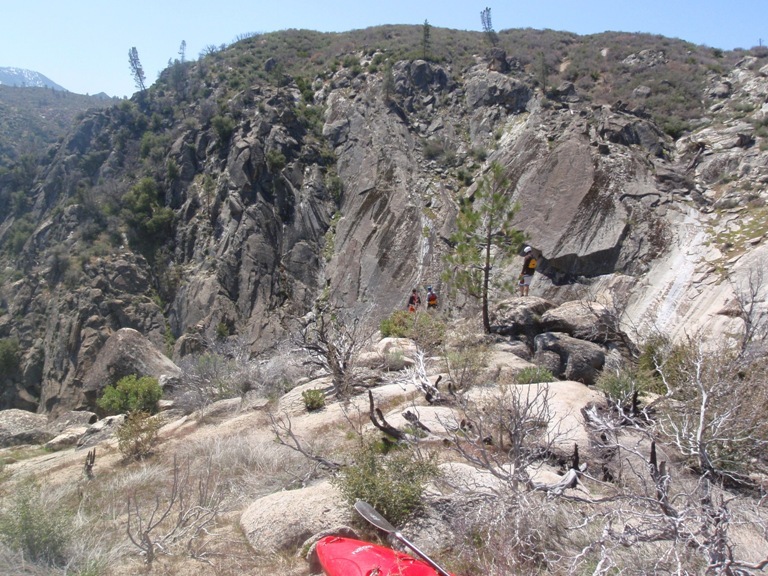 From there we were able to walk down the granite backside of the slope down to the Termination Drop. Portage Number 7. 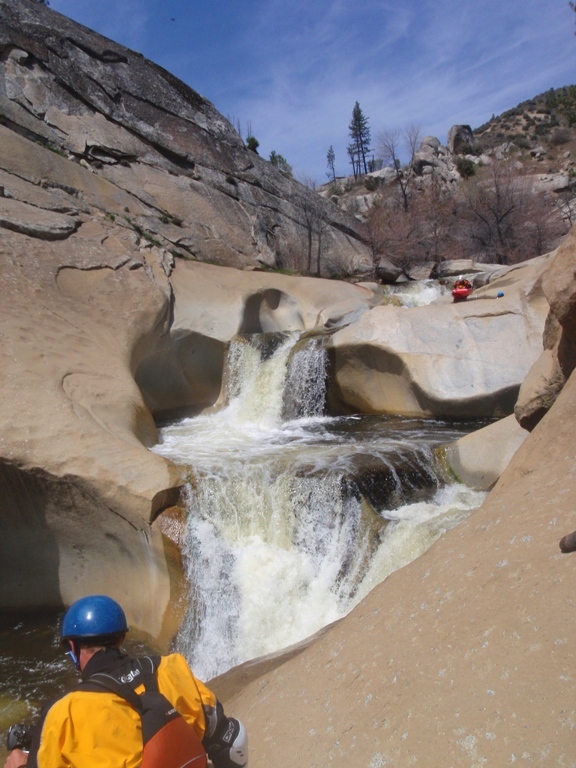 ~40 foot falls that lands on rocks. 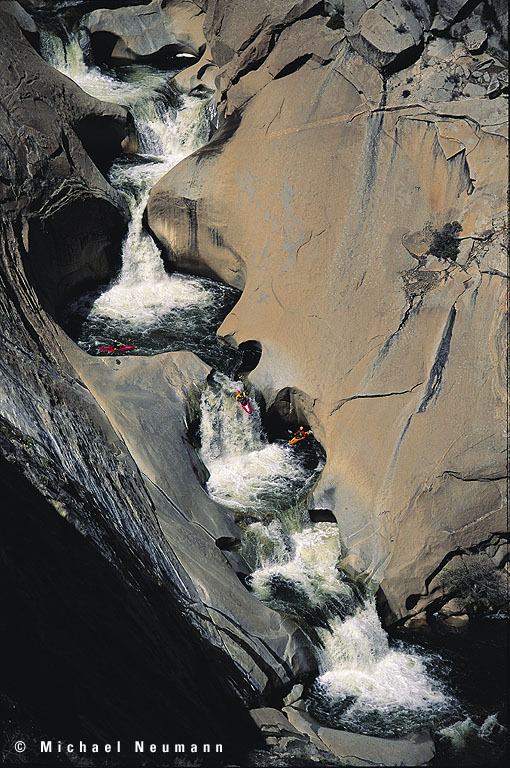 In the 1998 a paddler missed the take-out eddy and dropped over this falls. 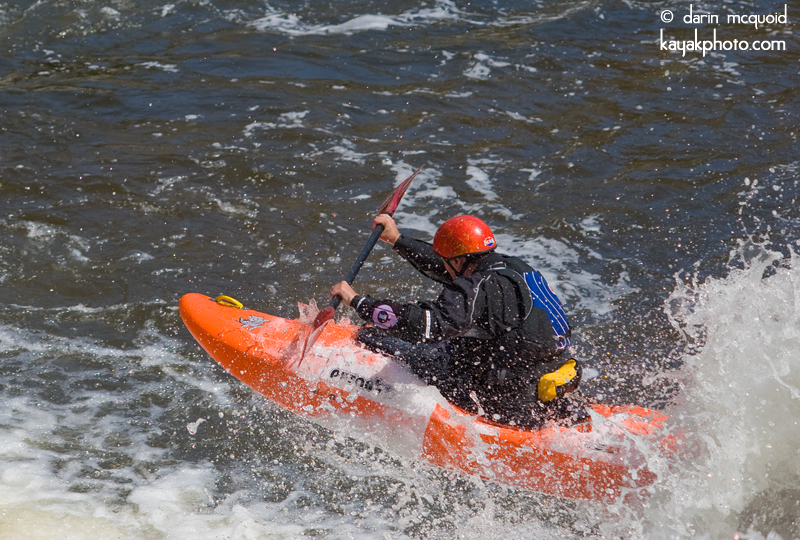 Though his boat landed his upstream of the rock he used his arms to protect his body which resulted in compound fractures of both. If it weren’t for the “heroic” down-climb and rescue by Corran Addison the man may not have made it out alive. Portage Number 8. A huge slide (maybe 50 feet tall) that slams you into the right wall. Portage Number 9. 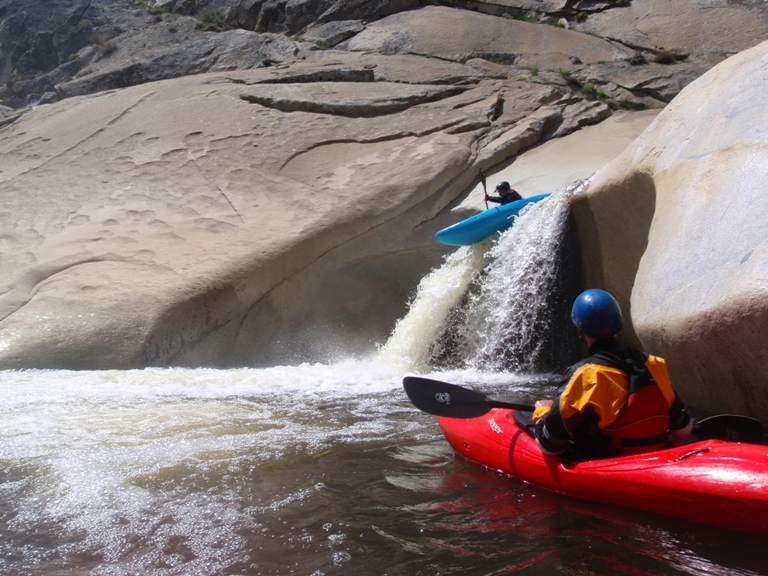 A large falls (40-50 feet) drops onto a slide that then slams the left wall before dropping into a sieve formed by the two walls touching with the water flowing through a crack underwater. Number 10. 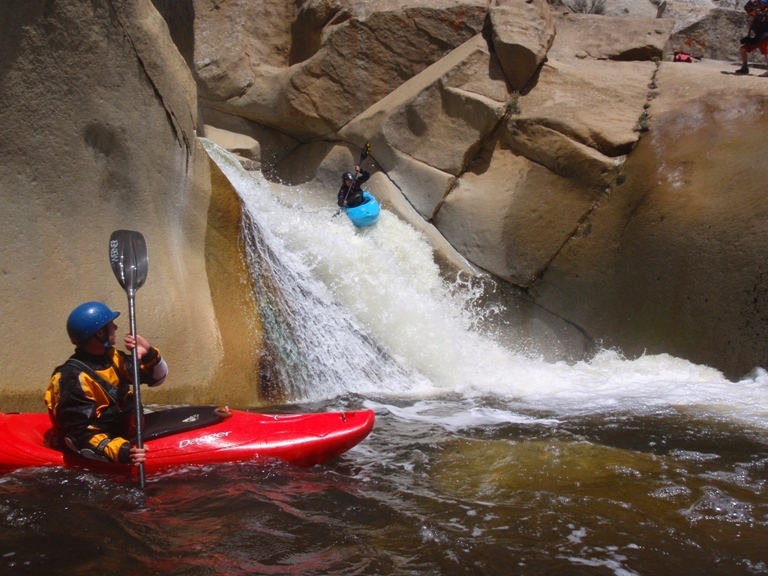 The Termination Drop lands you directly in the North Fork of the Kern and is an absolute blast to run. A 30 foot slide accelerates you to a kicker off of a ten foot drop that launches you into the air for some major air time. I couldn’t stop laughing for several minutes after running this drop, such a good time! 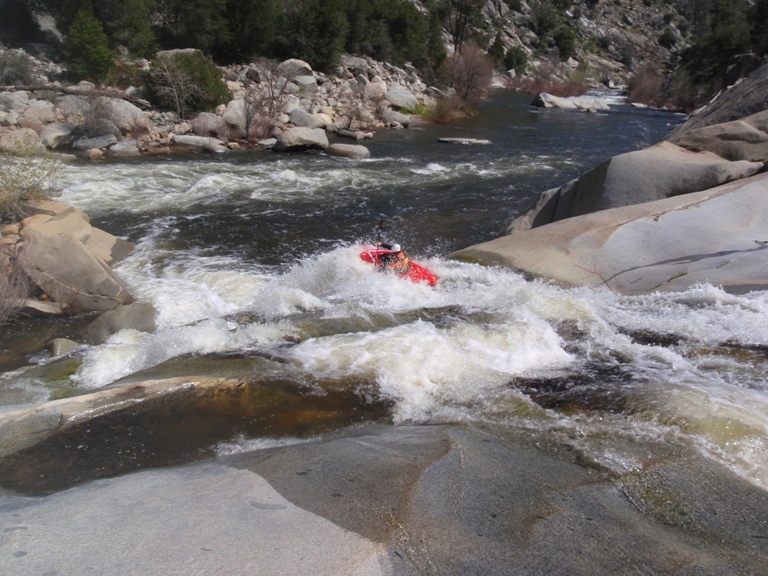 North Fork of the Kern. 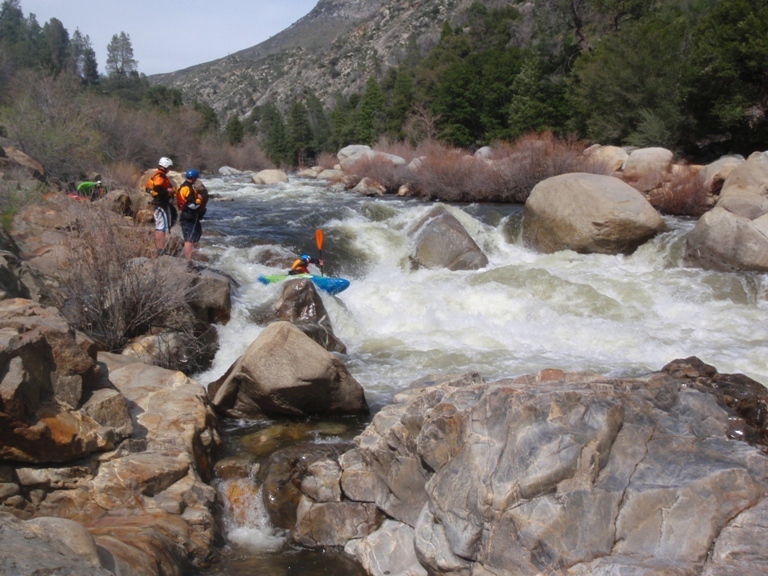 Several class III/IV rapids are downstream. Carson Falls (V). Scout on the left or right. 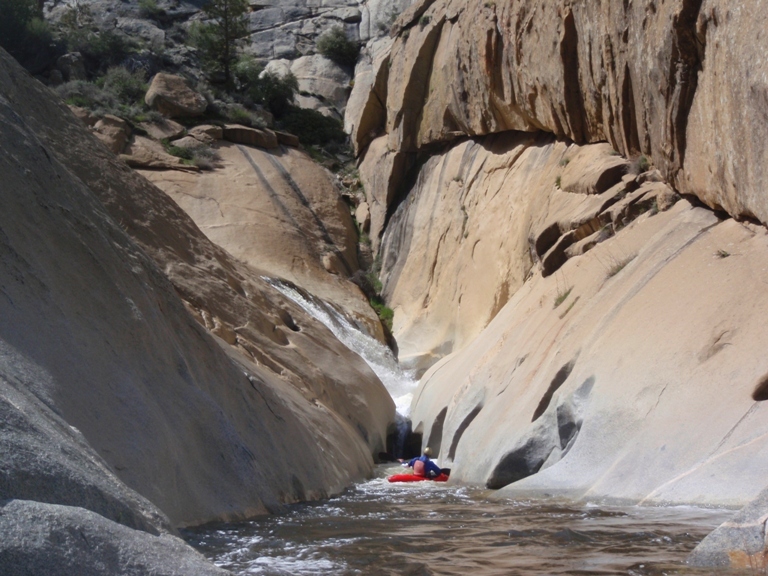 Huge holes and dangerous underwater rocks make the sneak down the right or a portage a good decision. 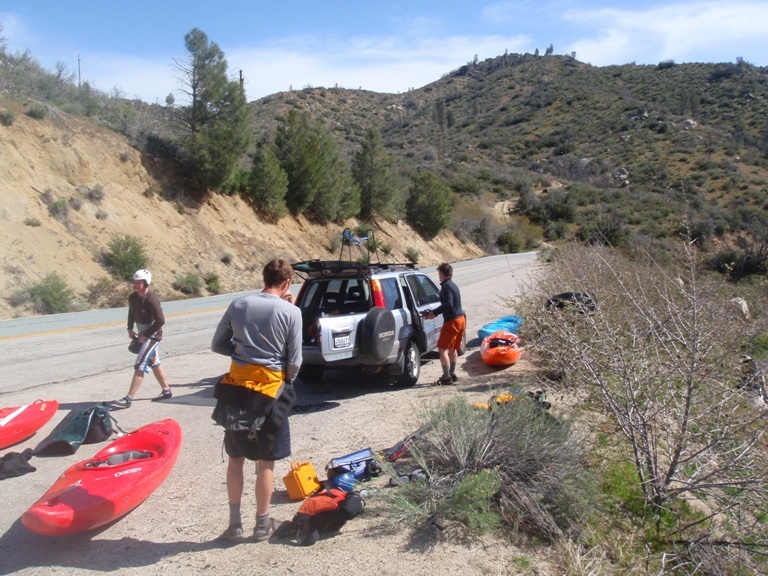 Take-out: Take Mountain Highway 99 up the North Fork of the Kern for 30 minutes or so until it crosses the river at Johnsondale Bridge. This is take-out. Put-in: Continue up the road, you will pass a waterfall on the left after a mile or so. The road then takes a switch back to the right and again to the left. You have no driven about 3 miles and you will see the only dirt road on your right. Either go up it with your nice 4-wheel drive truck until the road ends (or you can’t go further) or park on the main road 50 feet further up the road at the large turnout on the left. From there, hike up the road until it ends. This is only a quarter mile or so but almost all the elevation gain takes place. 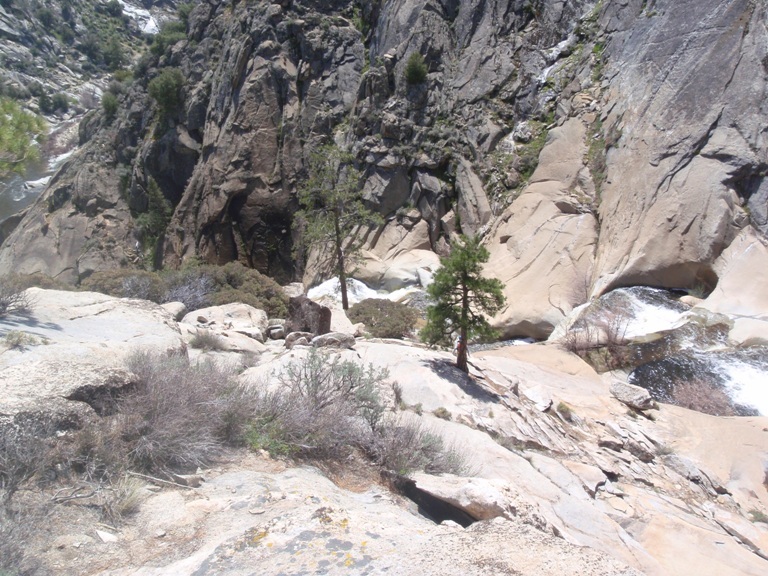 If you drive up it, the hike is all easy. 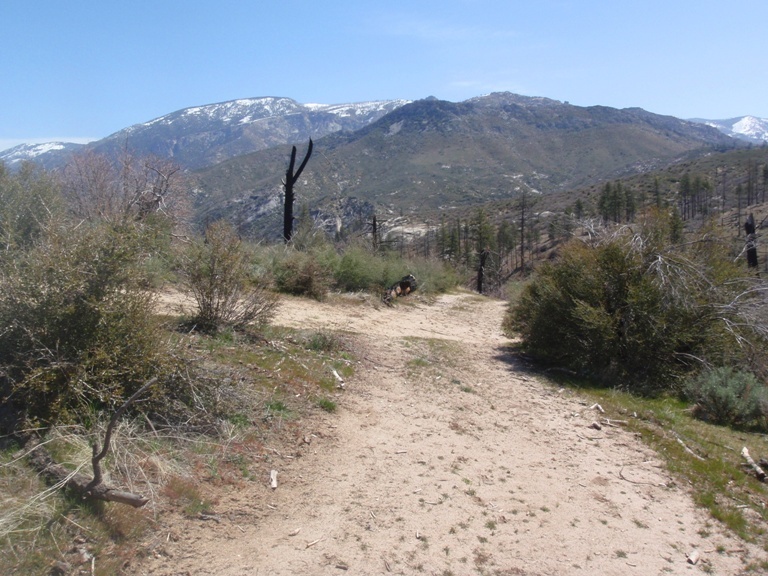 From there, the road turns into a trail and continues up the ridge. Cross under the barbwire and down the left into a ravine. Follow the ravine downhill and it soon opens up into a meadow with very small creek running down it (only a trickle). Continue heading down the meadow. Near the end go over the small bump of a ridge to your left where you should see a old fire road. We hiked the last little bit on the fire road until it hits the Creek, though you could also easily just follow the trickle to Creek. From here you can either put-in on Dry Meadow Creek and portage, run some mank, or you can cross the creek and climb over the small ridge on the opposite side. From there, you can drop straight down into the Tea Cups. From the main road to the Creek it is 1.9 miles, to the Tea Cups it is another 0.3 miles or so. Plan on the hike taking at least 1 hour. It took us about an hour and a half with several leisurely breaks.